Monish loves writing. He hopes to publish his stories and become a journalist one day. Aakanksha is a free-spirited woman who loves talking to people. But she carries a burden deep in her heart and she is unwilling to share it with anyone. Their paths collide at The Hindu Literature Festival. The connection is spontaneous and electric. Will Monish go on to become a published writer? What worries Aakanksha? Will they choose to stick together as they pursue their dreams? A short bittersweet romance from debut author - Rayaan. READ IT FOR FREE ON AMAZON KINDLE UNLIMITED! 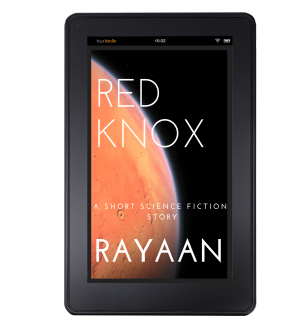 I represent the Indian Space Fleet assigned to annihilate RedKnox of Mars. Click the box below to read for free! Are you a book blogger or a #bookstagrammar? Do you wish to review my short story? Send me an email. I'll be delighted to share the PDF copy.